The Odyssey pool from Trilogy Pools is a large 38′ x 16′ rectangle pool. The shallow end has full width steps which can also double as seats. The deep end has a full width bench that is a perfect area to sit back and relax. With a gradual slope and a max depth of 5′ 10″ this pool is a great option for those looking to play water basketball or water volleyball. 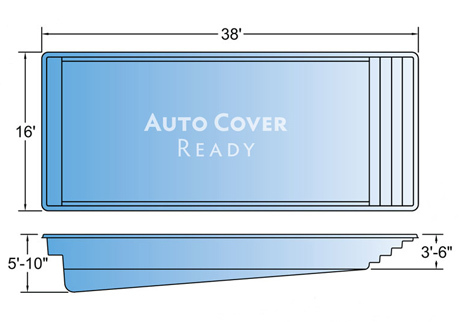 This pool can be equipped with an under mounted auto cover as the pool is a perfect rectangle. The Odyssey pool is built in Illinois by Signature Pools.